In today’s product review, we look at two card games that are all about matching colors, identifying patterns, and scoring points, but in very different ways. Today, we put Takat and Noueni under the PuzzleNation Blog microscope! 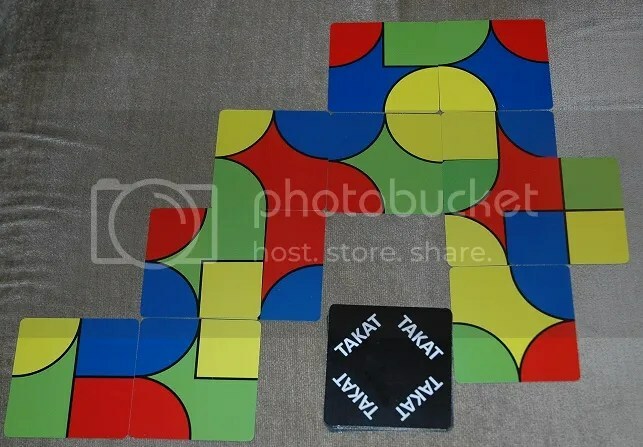 A card game for 2 to 4 players designed by Tyler Kilgore, Takat is different from most pattern-matching tile games or card games because it’s not about maximizing points…it’s about scoring as few points as possible as you place cards and create different colored shapes on the board. The game starts with each player secretly drawing a card that reveals that player’s color for this game. 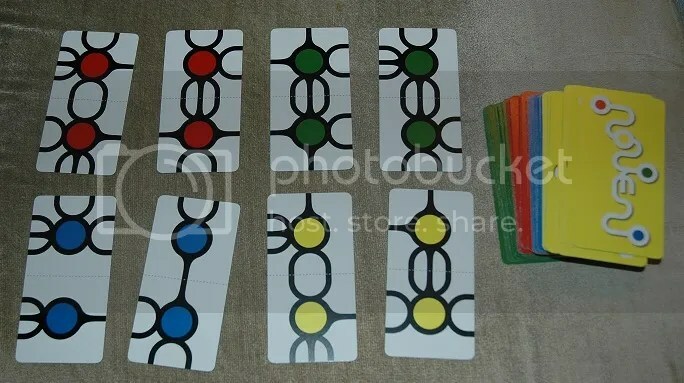 Not only are you trying to conceal your color from your opponents, but you’re trying to guess what color they have, based on how they place cards and build shapes on the board. The multicolored patterns on the cards allow for all sorts of placement options. When you place a card, you can either neighbor a card on the board or partially overlap it, but you always have to make sure the colors match. If the edge of a card is red and blue, the card you place beside it must also be red and blue. In this game in progress, the players have mostly avoided completing any shapes; there’s the mostly-round yellow shape on the top right as well as the pointy red shape below it (which is partially formed by two overlapping tiles, unintentionally obscuring the black line at the bottom right of the yellow shape.) Those two are the only shapes completed, which means those shapes are worth more points than shapes that aren’t enclosed by black lines. But since you can score points on neighboring tiles as well as completed shapes, you have to pay as much attention to who placed a tile as you do to what tile they placed. 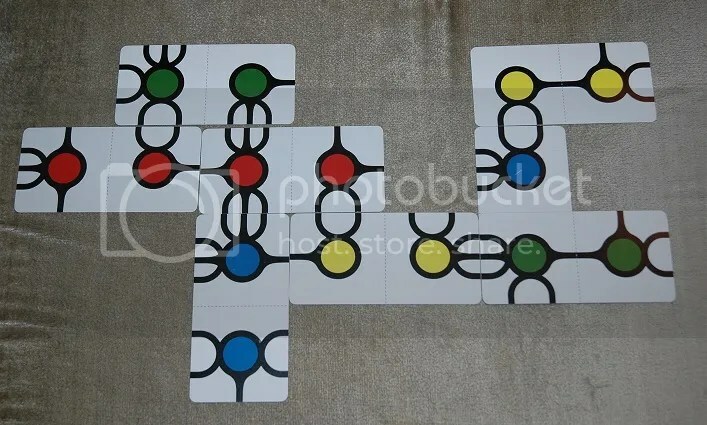 For instance, on the bottom left, there’s 2 points for the neighboring red tiles, 3 points for the blue shape above it, and 2 points for the yellow rectangle beside the blue shape, despite none of those shapes being closed by black lines. The game ends when all cards have been played. Then the players reveal their colors, and the points on the board are tallied up, based on how many shapes were made (and how many were completed), as well as how many cards were used in making each shape. The lowest score wins. The game play of Takat is pretty easy to pick up, but the scoring is a bit more esoteric and takes some getting used to. It does, however, make for a fun variation on the usual tile-placement scoring game, and as a fan of games like Mafia and other bluffing/concealment games, it does make for a more tense playing experience than your average round of Qwirkle. Now let’s take a look at Noueni. 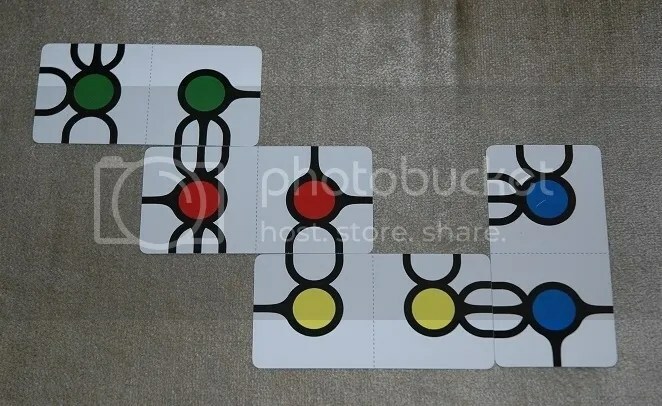 Designed by 263 Games, Noueni is also a card game for 2 to 4 players that involves pattern-matching, color-based scoring, and cards that can either overlap or sit next to other cards. But there are some important distinctions between Noueni and Takat. For example, each player chooses their color at the start of the game, and there’s no attempt to conceal it from your opponents. Also, like many pattern-matching games, highest score wins. In this game, your score is determined by how many of your scoring orbs are on the board by the end of the game. Each card has two colored scoring orbs and a pattern of black lines emerging from them. Those lines are the connectors, and they determine how the cards placed on the board line up. Any card played must link up with the other cards on the board, whether there’s zero, one, two, or three connectors along that neighboring edge. A few moves later into the game, the yellow (upper right), red (upper left), and blue (middle) players have all added to the board using those matching connections, but the green player has overlapped half of a blue card, using those connections and obscuring the blue scoring orb. And that’s where the strategy aspect of Noueni comes into play. It’s a mix of expanding the board and placing as many scoring orbs as possible, but also seizing the opportunity to hide your opponents’ orbs and match those same connection patterns. The game ends when all cards have been placed, and the player with the most visible scoring orbs wins. Noueni is more straightforward than Takat, which will make it more accessible to new players, but it also lacks the tension of hiding your color and ferreting out your opponents’ colors. On the flip side, Noueni does maintain that ever-present paranoia that at any point, someone might drop a card on top of yours and steal a key scoring orb at a crucial moment in the game. Both are terrific games that build on the pattern-matching color tile game format in interesting ways, requiring more from a player than simply outscoring their opponents. You need to outthink them too. Takat and Noueni are both available from The Game Crafter. This entry was posted in Games, PuzzleNation, Puzzles and tagged 263 Games, bluffing, card game, color, deduction, games, Geeking Out, Mafia, Noueni, pattern, pattern-matching, patterns, Pop culture, product review, PuzzleNation, Puzzlin' fool, Takat, The Game Crafter, tile game, Tyler Kilgore by gmdirect. Bookmark the permalink.